Arrival at Ben-Gurion airport; meeting and assistance by our representative, and transfer to Tel-Aviv for overnight. Dinner at leisure. Leave Tel-Aviv-via Ashdod-Ashkelon-Beersheba. A short visit to the Negev capital. Continue via Arad to Massada. 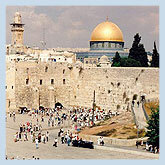 Ascend the fortress which was the last stronghold of the Jewish Zealots in their war against the Romans. Visit the excavations, Herod’s palaces, the synagogue, bath house, etc., overlooking the Roman camps and the Dead Sea. Proceed to Jerusalem for dinner and overnight. campus, Mt. Herzl and Yad Vashem (the memorial to the six million Jews who were killed in the Holocaust). 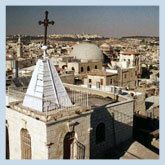 Then visit the model of the Herodian city of Jerusalem dating back to the time of the Second Temple. Continue to the Hadassah Medical center for a short visit to the Synagogue with its Mark Chagall stained glass windows. Dinner and overnight in Jerusalem. Walk through the Jaffa Gate to the Old City: the renewed Jewish Quarter; the Western Wall; the Temple area; the Dome of the Rock; the colorful bazaars; Via Dolorosa; and the Church of the Holy Sepulchre. Continue to Bethlehem to visit Rachel’s tomb and the Church of the Nativity and return to Jerusalem for dinner and overnight. Leave Jerusalem, driving via Hisham’s Palace. Continue north via the Jordan Valley and the new settlements, then via the Jezreel Valley. Continue to Tiberias, the old center of Jewish learning. Drive along the shores of the Sea of Galilee to Capernaun to visit the ruins of the ancient synagogue. Continue to a kibbutz hotel for dinner and overnight. Leave the kibbutz for Acre to visit the old, famous Crusader stronghold and medieval fortifications. Continue to Haifa, for a sightseeing tour of Haifa, including the Bahai Shrine, Persian Garden and Mount Carmel for a panoramic view of the city. Proceed southwards to Caesarea to visit the Roman theater and the Crusader fortress. Via Netanya to Tel-Aviv, drive through the main street-Ben Tehuda St., and Dizengoff St., pass by the Habimah National Theater, Mann Auditorium, then along Rothschild Blvd. Continue to Jaffa for a view of the old port, and artist’s quarter. Dinner and overnight Tel-Aviv. Transfer to airport. End of our services.